An intense struggle for dignity and the right to land is being waged right now in the green mountains of south western Colombia, and chances are, you haven′t heard of it. An intense struggle for dignity and the right to land is being waged right now in the green mountains of south western Colombia, and chances are, you haven′t heard of it. While the scant mainstream media coverage of the country focuses on soccer or peace talks between government and armed guerrilla groups, it ignores that same government’s attacks against communities defending their territory. On May 28th, one thousand riot police officers entered a sugar cane plantation called La Emperatriz in the municipality of Caloto, in the state of Cauca, to evict nearly 300 members of the Nasa indigenous people. 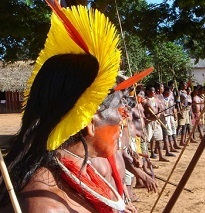 The indigenous community members had peacefully replaced the sugar monocrop for beans and corn, as part of the process they call the Liberation of Mother Earth. This follows other recent evictions in the nearby town of Corinto, which left many civilians wounded, and clashes since February that resulted in the killing of Nasa youth Guillermo Pavi. These confrontations occur in the midst of the community’s historic effort to defend their right to a dignified life by recovering land stolen from them – land which has been falsely promised to be returned. Why Liberation? Why These Lands? But these land takeovers have cost lives. According to Arcadio Mestizo, a leader of the indigenous reserve Huellas Caloto, on a night in 1991 the police and paramilitaries carried out the massacre known as El Nilo, killing 20 adults and children. While the slaughter occurred about 4 kilometers from the plantation, it was planned the night before at La Emperatriz. The largehacienda of La Emperatriz, once used to raise livestock and grow rice, now hosts the exclusive cultivation of sugarcane by the transnational company Incauca, owned by the millionaire emporium Ardila Lule and currently under investigation for price fixing. Cane production has significant environmental impacts, such as biodiversity loss and toxic residues. La Emperatriz is just a sample of the economic reality of a region which has been transformed into a ‘green desert’ where sugarcane grown to produce biofuels replaced subsistence crops that fed thousands. Following a ruling in 2000 by the Inter-American Commission on Human Rights, the Colombian state accepted its responsibility in the 1991 El Nilo massacre and agreed to transfer 15,600 hectares of land, including La Emperatriz, to the Huellas Caloto indigenous community. Trusting the agreement, the Nasa people suspended land takeovers. But time went by and the land promised by the government did not come through. Although in 2010 the government completed the transfer of the number of hectares of land promised, they are not the lands agreed upon, and much of it is not suitable for agriculture. So the Nasa vowed to “liberate” La Emperatriz hacienda. The latest wave of liberation began in March, with the Nasa occupation of land, cultivation of maize, beans and cassava, and the construction of basic structures. 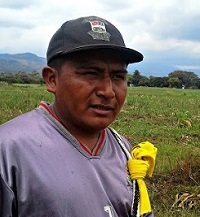 However, community leader Emer Pinzón said that in the morning this past May 28, the owner of La Emperatriz ordered their removal: “Riot police came in with their full war machinery ” and encountered 300 Nasa members armed with courage, shovels and stones to defend their efforts and dreams. This violence against civilians comes amid peace negotiations between the government and the FARC guerrillas. Constanza Cuetia, a member of the Nasa community′s communications team, reflected, “The war is very much present in our communities. Targeted assassinations and recruitment of civilians continued during the ceasefire. In addition, the peace talks do not get to the heart of the conflict. The government’s delegate to the talks said that the [neoliberal] economic model will not be challenged in the negotiations.” Indeed, the government has เล่นคาสิโนออนไลน์ให้ได้เงินjustified the violent evictions defending the right to private property of a few, while ignoring the right of many for a dignified life. The spokespeople of this community make it clear that the main reason for the liberations is not unfulfilled land agreements; this is only one ingredient in the recipe of reasons for why the Nasa struggle. 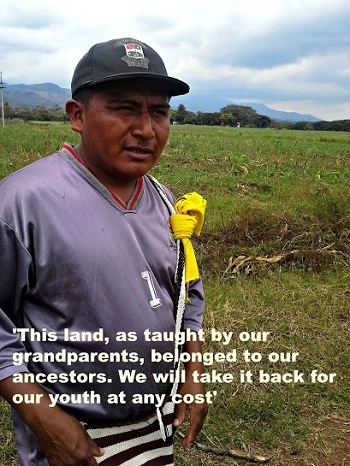 “We do this to reclaim our land, but also to defend our social rights,” Mestizo explained. This strategy of liberation becomes even more urgent in light of the many “diseases” these territories face. “We have a major threat coming: mining, for which we must prepare,” Mestizo said. “Mining creeps in more quietly than sugarcane, and sometimes the community does not see it, but we have learned that mining companies, such as [South African] Anglogold Ashanti, have requested mining permits over our land, regardless if it is on a protected area or an indigenous reserve’’. Natalia Fajardo is a Colombian writer and an active participant in movements for immigrant rights and economic justice. What is Peru’s biggest environmental conflict right now?